DETAILS Print the bunny template. Cut out the small bunny with good scissors and punch out the eye with a hole puncher. You might want to use heavier paper to make the pattern easier to draw around. Using lightweight 8 1/2" by 11" paper, cut three strips measuring 2 3/4" by 10". Fold each piece in half. Open the folded paper. Bring the two sides to meet at the center fold line. Crease the newly created folds. You should have four equal sections divided by the folded lines. Unfold the paper and refold, making accordion folds - forward and back. 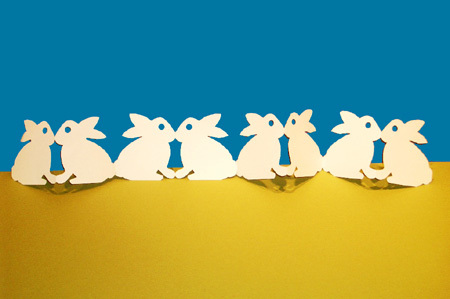 Lay the bunny pattern on the folded paper, with the bunny's base on the edge and his nose and toes on the fold. Cut out the bunny shape. Punch out the eye. Repeat the process making as many bunnies as you want, joining the sections with transparent tape. The final result is a chain of charming bunny rabbits. MATERIALS NEEDED Bunny pattern, scissors, paper punch, pencil, 8 1/2" by 11" lightweight paper. transparent tape. Optional: heavy paper for pattern.